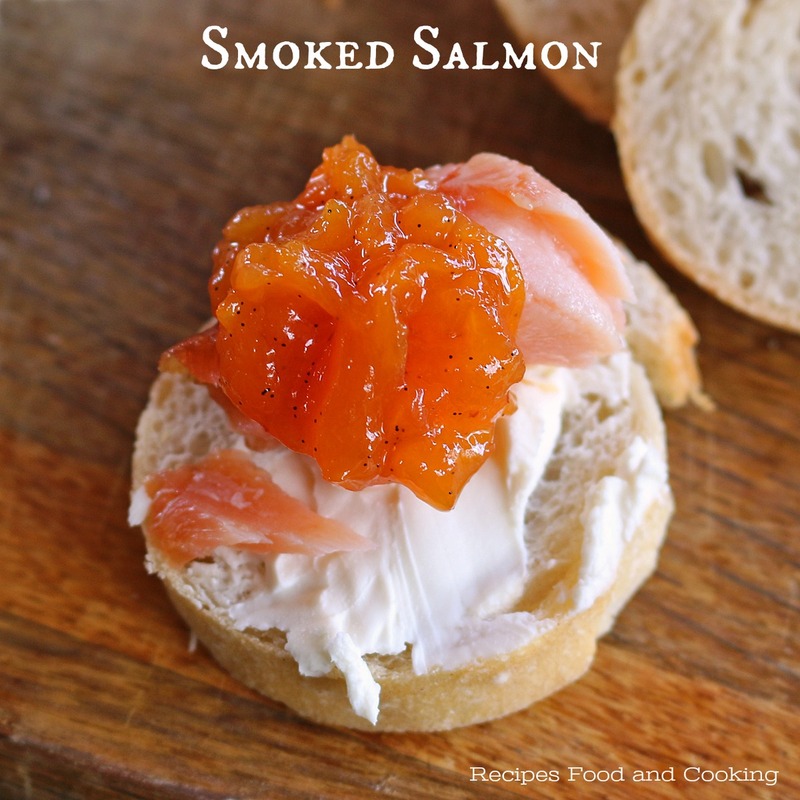 I decided to see this week if I could smoke salmon on the grill that would come out like the lox you put on bagels. It’s one of my favorite treats on the weekend when I can get fresh bagels. 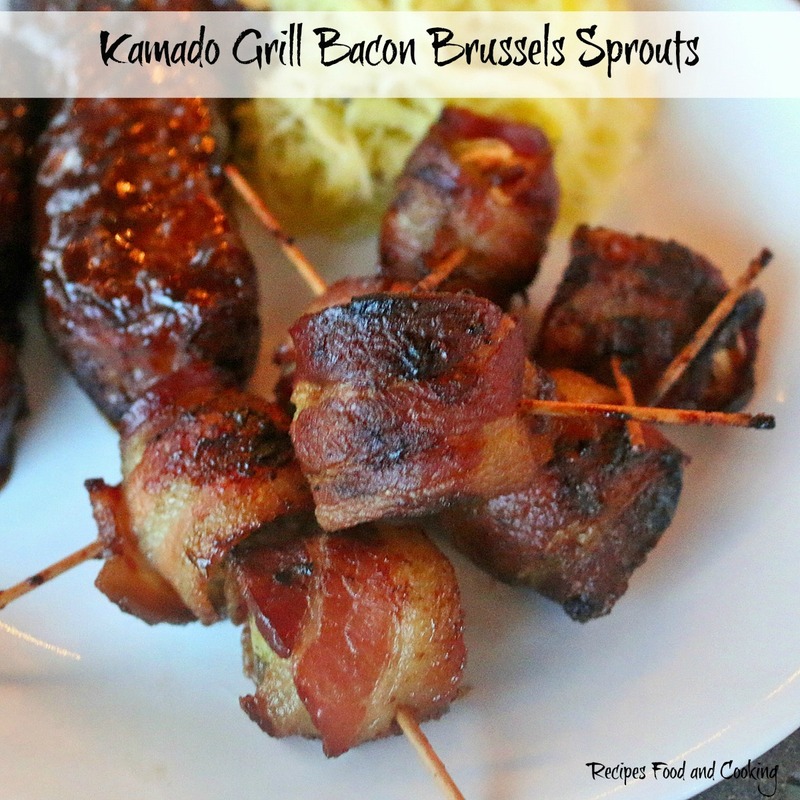 I have to admit this came out really well and it will be on the menu often around here. I started with a 2 lb. piece of boneless, skinless salmon. I then mixed together kosher salt, brown sugar and orange rind. Half of the mixture goes on the bottom, then the salmon and all is topped with the remaining salt mixture. Because I hate to waste anything, I cut the orange in slices and topped off the salmon with them. Then it all gets covered and goes into the refrigerator for 48 hours. After 48 hours you are going to rinse the salmon in cold water. Mine was a touch saltier than I would of liked so next time I am going to put it in an ice bath for 5 minutes (see my note in recipe – I’ll update this the next time I make this) Pat it as dry as you can get it, then it goes back in the refrigerator for 4 hours uncovered. 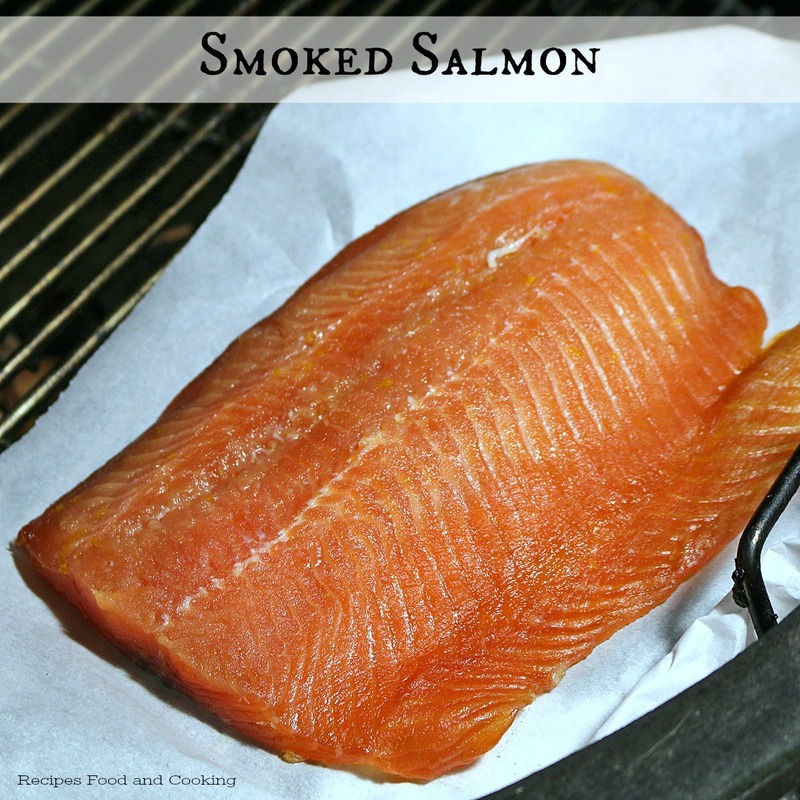 You want to cook the salmon as low as you can get your Kamado to go. I cooked some turkey wings on mine for a couple of hours first. Then when they were done I added 3 cups of cherry wood chips I’d had soaking for 2 hours to the coals. Let them get to smoking and shut the grill down to 1 on the bottom and as low as you can on top without smothering your fire. My temperature gauge said I was at 175 degrees but the area I smoked the salmon in felt cooler than that. The salmon was on the indirect side of the grill. 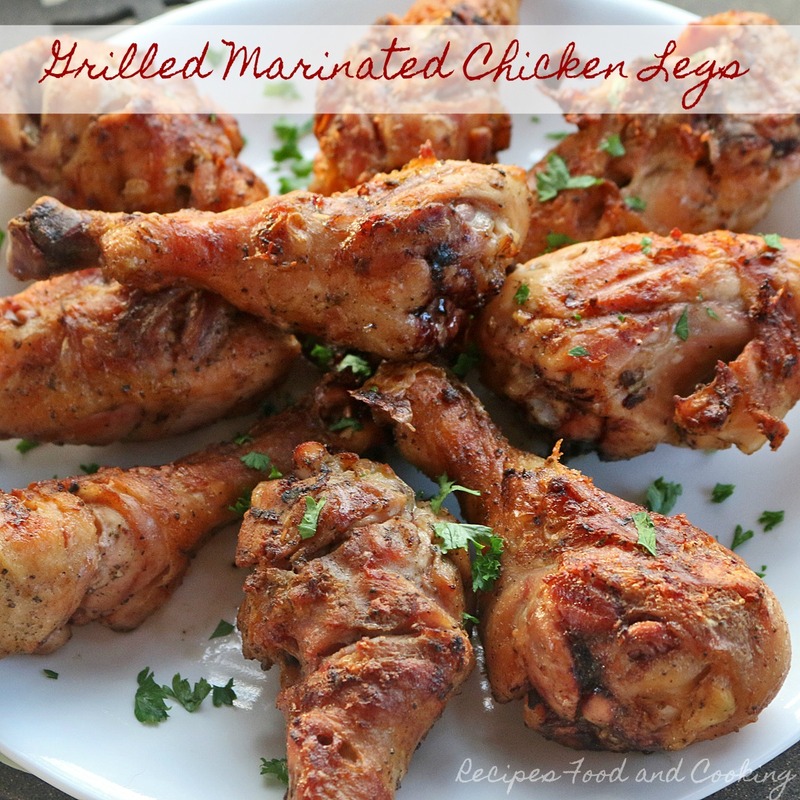 I found myself wishing for a thermometer for the inside of the grill and will for sure have one next time I make this. I decided to put my salmon on parchment paper since it was skinless so I didn’t have problems with it sticking to the grill. I covered my salmon again with orange slices. I continued to watch my fire carefully as it smoked. All and all it took about 1 hour and 45 minutes before I took it off the grill. You want the salmon to be 145 degrees in the thickest part. It should easily flake at this point. 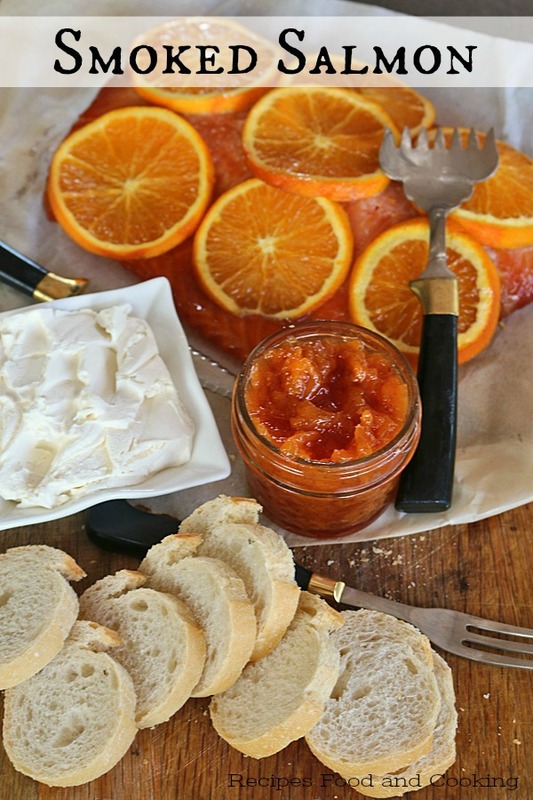 I served the salmon with french bread, cream cheese and homemade peach jam. It would be perfect on bagels with cream cheese also. For me this is definitely a make again recipe. The only thing I would change is how long I’d rinse the salmon as discussed above. 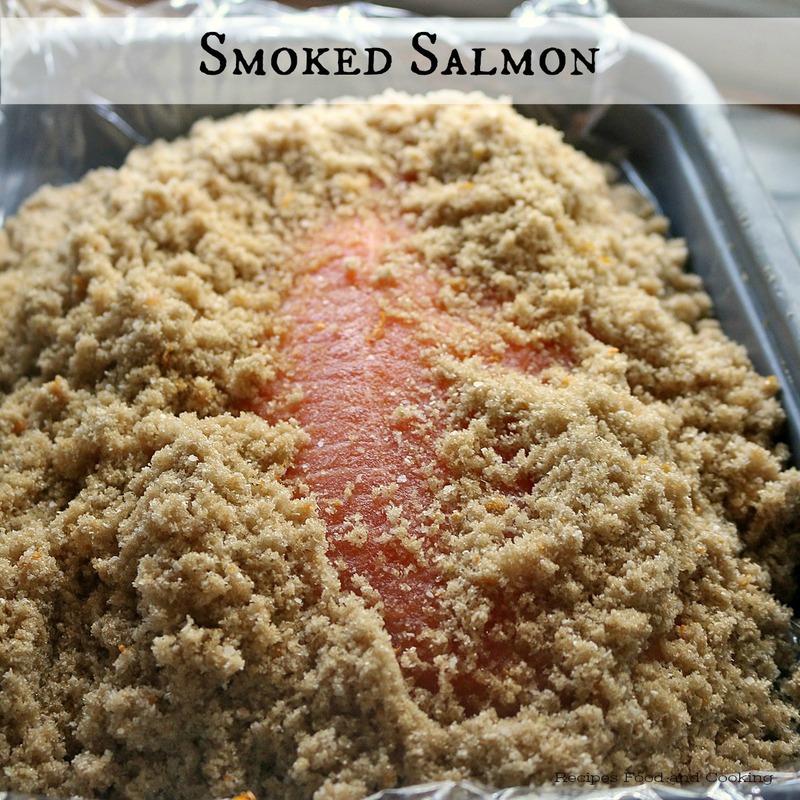 I had originally intend to see if I could cold smoke the salmon in a kamado but couldn’t get my temperature down low enough. It also was in the 90’s here in Florida so I was concerned also about the safety of cooking at that temperature. The flavor and texture were really good done this way so all and all I’m happy with the results. It was slightly sweet, salty and had a hint of orange. Do you have some left? I did so I took about a cup of salmon and flaked it, added it to 8 oz. softened cream cheese with fresh chopped chives and made a great dip for crackers with some of the salmon. 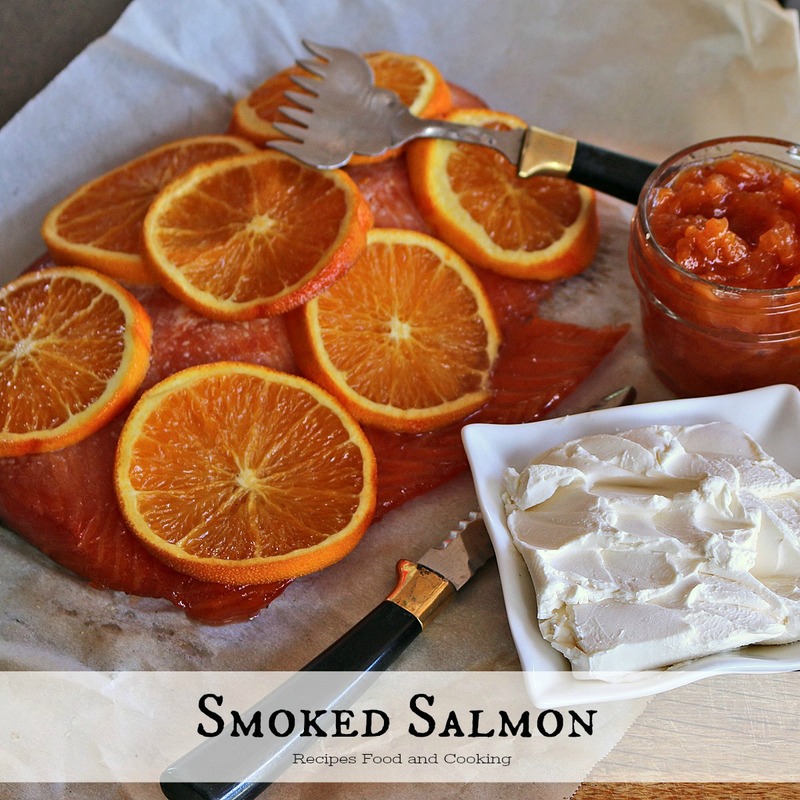 Smoked salmon should be eaten within 3 days stored in the refrigerator or can be frozen. 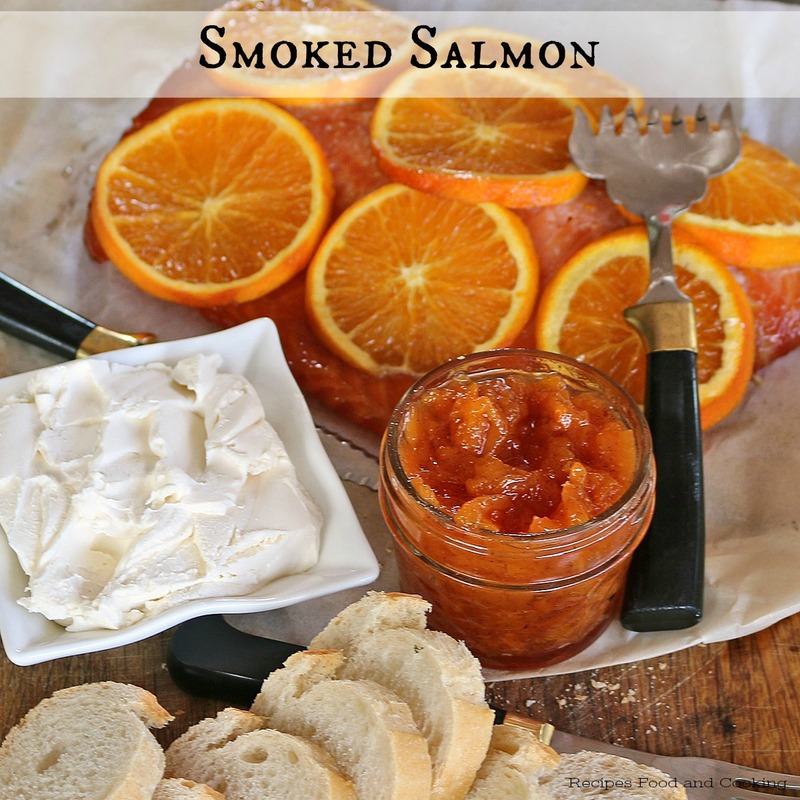 Kamado Grill Smoked Salmon, marinated for 48 hours in brown sugar, salt and oranges. Smoked for 2 hours with cherry wood. Mix together the salt and brown sugar. Zest the orange and add to the mix. Slice the remaining orange. Line a pan with saran wrap. Put half of the cure on bottom of pan. Add fish. Top with remaining cure mix. Top with orange slices. Wrap well in plastic wrap. 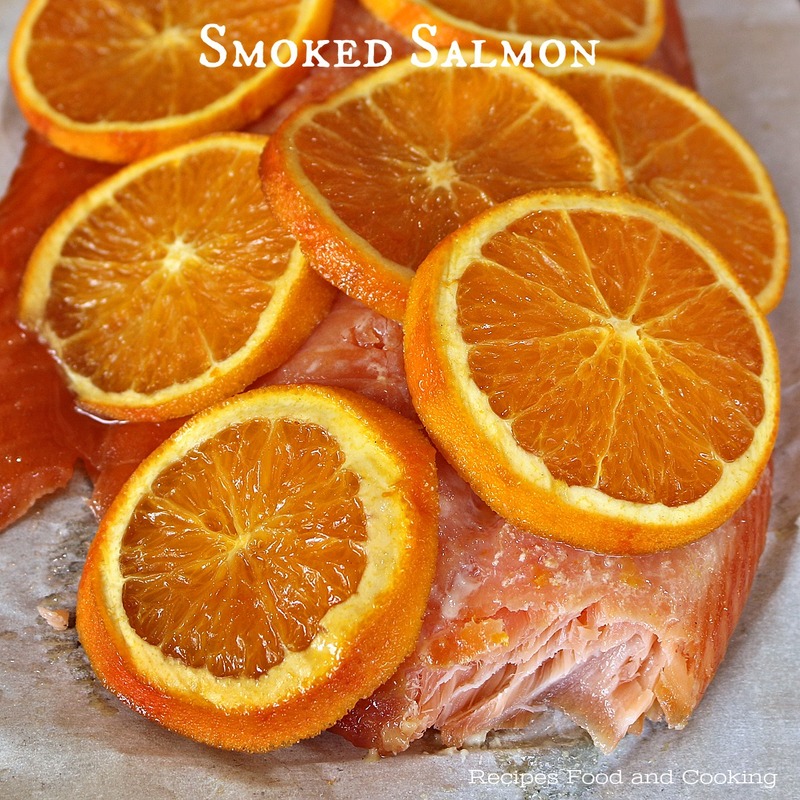 Remove from refrigerator and rinse salmon well with very cold water. (See note) Pat dry and put back in a pan and refrigerate 4 hours uncovered. I wrapped the orange slices in plastic wrap until my salmon was getting ready to go on the grill and refrigerated them. Start a fire on half of the grill. Let it burn down until the temperature is at 175 degrees. I had my top and bottom vents on 1. Right before putting the salmon on the grill on the indirect side, add 3 cups of smoking chips that have been soaked for at least a hour. 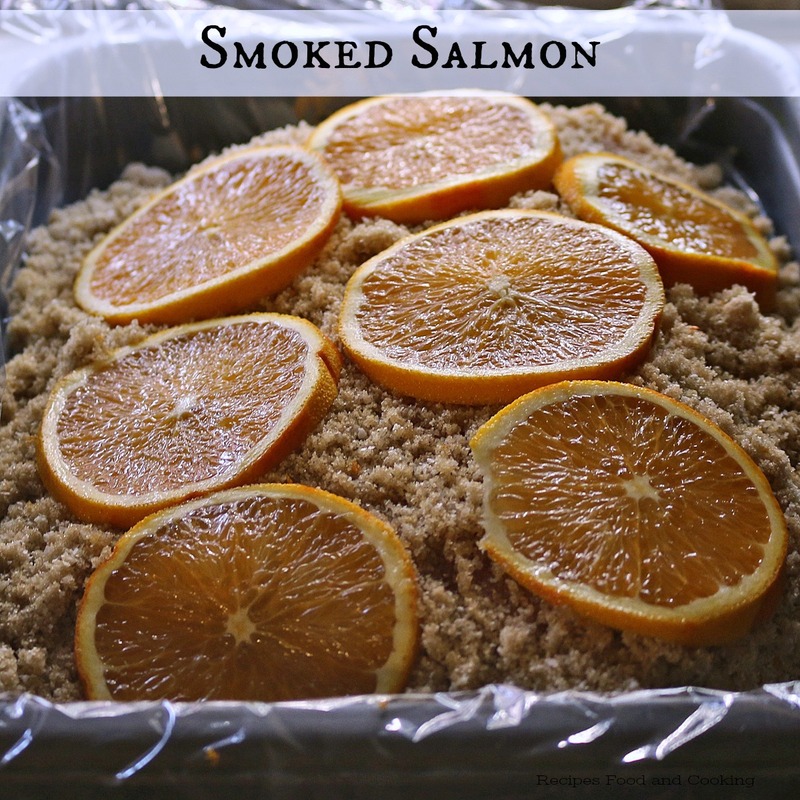 Put salmon on a piece of parchment paper and put on rack with oranges on top. Cook for about 2 hours or until salmon reaches 145 degrees in the thickest part. I wish I had soaked the salmon after curing it for 5 minutes in some ice water to draw out a little or the salt. It was really good as it was but I would of preferred a little less salt especially on the thinner side of the salmon. My water isn't real cold living in Florida (especially in the summer) and not a lot of pressure so think a quick ice water bath would of been beneficial. Pat it really dry before putting it in the refrigerator without being covered for the 4 hours. Thank you Pansy, I appreciate your kind words. Wow!!! All these recipes are looking delicious and great combination. 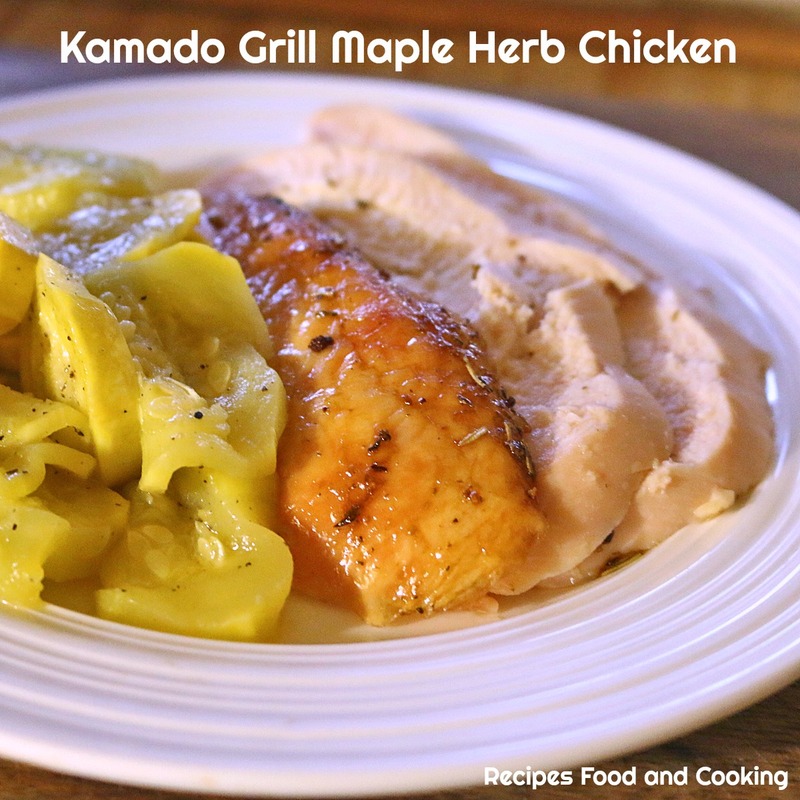 Thanks for sharing these great dishes.